Description: Herb 5–30 cm high; dioecious or polygamous. Leaves 3, well separated or occasionally lower 2 basal, 15–35 cm long; lowest leaf filiform or linear, 0.2–4 mm wide, occasionally to 5 mm; second leaf filiform or lanceolate and tapering, base dilated or occasionally like lowest leaf; upper leaf dilated with short or long narrow apical portion. Inflorescence open, 1–11-flowered, usually 2–7; flowers unisexual and bisexual. Tepals 3.5–11.5 mm long, white with purple nectaries; nectary 1 per tepal, a quarter to half from base, a slightly thickened transverse band, occasionally with a partial or complete but narrow break at middle. Stamens half to two-thirds as long as tepals; anthers c. 1 mm long, red or purple. Distribution and occurrence: Widespread over the whole State and the rest of temperate Australia. 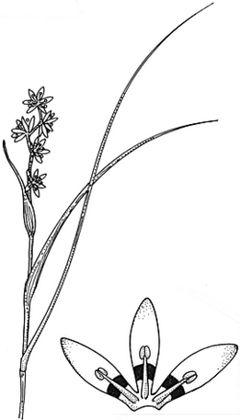 Grows in forest and woodland, and on inland sand dunes and loam flats.